“Yes, you do,” I smiled. “And one daddy,” he quickly added. Make no mistake: our son was conceived with the help of an anonymous sperm donor, something he won’t know about until he’s a little older. I couldn’t help but smile. But of course: Amanda, the dyke daddy. They’d recently done a unit on the family at preschool. My son had proudly made a collage depicting his parents, two women cut out of a clothing catalogue and pasted together, creating the consummate dyke couple on green construction paper. “Les Mamans,” one of his teachers had titled it in red marker, which translates literally as “The Moms.” We were incredibly touched when he brought it home, although we had to laugh – the same femmy model is featured in both images, looking a lot like me (times two) and not at all like Amanda. There was also a Bristol board poster prominently displayed in my son’s classroom, with family photos of each of the kids in the class. The photo we’d sent to school – the three of us in our matchy-matchy Canadian Olympic hoodies, waving flags on the Drive after Canada’s gold medal hockey win – was featured front and centre. The kids poured over the poster at circle time, as the teachers led a discussion about each child’s unique family make-up. It was wonderfully heart-warming and validating. After all my initial fears about sending my son out into the big, straight world on his own for the first time, our family unit was being accepted and included by his school as a matter of course. 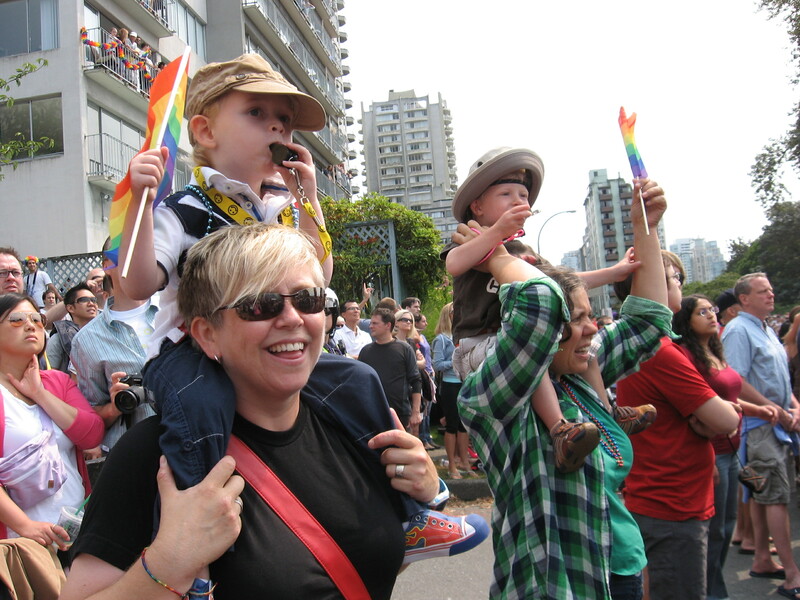 Having heard countless stories over the years about other queer parents tirelessly educating their kids’ teachers and daycare workers, we realized yet again how fortunate we are a) to live in a large, urban centre in 2011, with a sizeable, visible queer community, and b) to have found a progressive preschool where diversity is recognized and celebrated. Here we go, I thought. His first sense of being other. I imagined my mother cringing, her words from years earlier coming back to haunt me: “Children need both a mother and father figure,” she’d opined, long before she knew she was going to be a grandmother to a boy with dyke mommies. This, from a liberal-minded, United Church-going woman – the same message we get ad nauseam from the Family Values crowd. As I crossed the school parking lot clutching my son’s little hand, his simple yet oh-so-complicated want still ringing in my ears, I could picture the entire Christian Right wagging their righteous fingers at Amanda and me, proclaiming: “We told you so!” I momentarily kicked myself. We’d had the best intentions to surround my son with positive, male role models, pseudo-Daddy figures, but had been sorely falling short. We’re a bunch of dykes, after all – there are not a lot of men in our close, inner circle. My son’s grandfather and uncles live so far away, and we’ve fallen hopelessly out of touch with our closest gay friends, all of whom are childless. Then I quickly got a grip: my son’s got two loving parents and a supportive, nurturing home. He’s growing up just fine. That said, the daddy issue was bound to come up sooner or later – and in our case, much sooner than we’d anticipated. When I was a kid, I’d often felt “other” because my parents are both immigrants and a good ten years older than the parents of most of my peers. I went through a period in elementary school where I longed for parents who were “normal” – i.e., younger and more “Canadian.” But my son’s only three, and he’s already starting to figure out that his family is not like the others. And he’s already identified the key difference: the daddy factor. “There’s a huge gap between seeing your family accepted and included by the school, and seeing your family reflected back at school as the norm,” Amanda reminds me as we talk about it later. She points out that other than that one-off daddy comment, my son seems perfectly happy with his family just the way it is. Likely, he’s just trying to figure out how we fit into the images of family that he’s seen at school, images that he’s bombarded with, in fact, everywhere, every single day – pictures that don’t quite match his reality. Just like his mommies, who will religiously watch the latest dyke flick or devour the latest lesbo-novel even if it got panned by the critics, our son, too, is starved for queer content that reflects his experience of the world back at him. He can see for himself that he’s the only one in his class who made a collage with two moms, and that most of the other kids have a mom and a dad at home. And now, he’s claimed Mama Manda as his daddy. Having grown up a tomboy, one who always snagged the role of “dad” in childhood games of “mums and dads,” Amanda is secretly thrilled. She recognizes that this new designation is more about the role she plays in our family as the butchy “other mother” (as opposed to me, the femmy “tummy mummy”) than about our son wishing she were an actual man and bona fide dad (although that may well come later). A few weeks after counting twos in the bath, my son was in his bedroom, playing trains. As he loaded imaginary passengers into the cars, he nattered away about his two moms and his daddy, all in the same breath. This entry was posted in father figures, non-biological lesbian mother, Out in the world, preschool, roles, Uncategorized and tagged non-biological lesbian mother, queer parenting. Bookmark the permalink. I love that you shared this aspect of your family life in such a perfectly put together piece. You’ve mentioned the daddy phenomenon but now you have created a more I’m depth piece hitting your own fears, answering reader curiosity and with your trademark hunour as well! We just found your blog, but we will definitely follow you in the future! We already linked your blog to ours! We are still TTC (our first) but love to read all kinds of LGBT parenting blogs! I enjoyed reading your blog as it let me know we are not alone in this issue. Our son has starting calling me “daddy”. He knows he has two Moms and he says he understand but he calls me “daddy” everyday. It started for him around Fathers day when everyone at school was talking about their Dads and making gifts for Fathers. There are times where I am nervous and uncomfortable about what others may say or think but then I realize my son is a happy child and he is simply expressing what he sees as “the norm”. Thank you again for sharing this story. Glad to hear that this post is still striking a chord with other queer families.